Last year, while on tour at the Atelier, I had the opportunity to meet and later speak with several of the artists working there. When today turned out to be a pleasant and not-too-cool early Spring day, I decided to check out the Artists in Action program in the Motor Exhibits Building. I’m glad that I did, as I had the opportunity to meet and chat with a number of the artists who have studios there. In no particular order, here are impressions that I had of some of the artists who I talked with. Bruce Lindsay taught me a new word today – biomorphic – which means “resembling or suggesting the forms of living organisms.” The word came up when I asked him the meaning of the object that the male figure is carrying on his shoulders in the work, Use of Memory. This sculpture is currently on display in The Meadow, as part of the MYTHOS exhibition. In the studio, Bruce showed me the smaller initial version of what ended up as the object that the “man” is holding up. 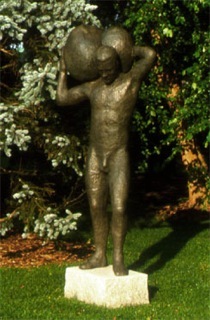 Initially, he developed an original shape, and then over time developed it into what is currently part of the sculpture. It is biomorphic, not something that we recognize, but that suggests the form of something living. “What does it mean?” I asked. His answer — “whatever it means to the viewer.” He likes viewers to supply their own interpretation of his art work. 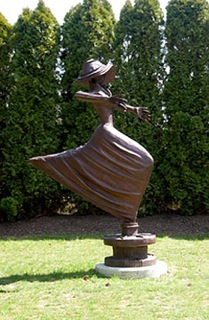 Clifford Ward provided me with the opportunity to see the origin of a sculpture that I have long admired at Grounds For Sculpture — Jubilant Dancer. 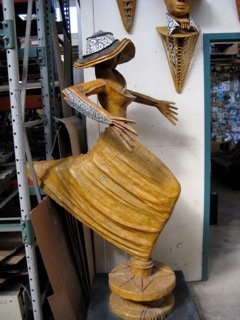 The original is made of plaster bandage, and the sculpture on display at GFS is an enlarged replica, cast in bronze. When I mentioned the use of plaster bandage by George Segal (Depression Bread Line), he noted that Segal molded plaster bandage over fully dressed human models. Ward, in contrast, built up his sculpture with plaster bandage, without the use of a human model. 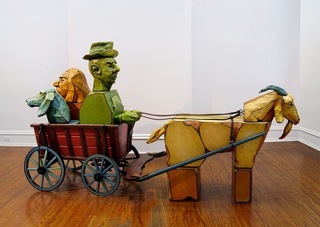 Some of the other items that he had on display outside his studio showed an interesting use of multi-media and color, along with carved wood figures. Michelle Post presents a whimsical view of life through her works. Her sculpture, Post Industrial (a play on her name), is done in painted Styrofoam, which she likes to use because it is easy to cut, quick to develop into what she wants to create, and light to handle. She became interested in carving heads from Styrofoam, and has developed a series which she calls “Tronies.” A collection of ten of her Tronies have been selected to be cast in aluminum and displayed in the amphitheater at GFS later in 2013. Autin Wright is one of the few sculptors I had met previously — during a tour of the Johnson Atelier, where he is the technical supervisor for Paint and Patina. He has several works on display at GFS, including Carmelita, the serpent-like fiberglass creature that seems to emerge from the pond in back of the Seward Johnson Center for the Arts. I questioned him about the name, as I had read somewhere that Carmelita was the name of his mother. He said that he named the sculpture in honor of his mother. When I questioned why he would name a serpent after his mother, he said that it was not a negative inference of how he felt for her. He does not necessarily give a descriptive name to a work of art. In this case, he wanted to honor her by naming a work of art after her. 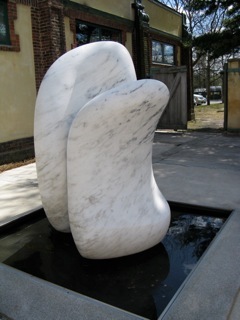 We also discussed his marble sculpture in the Water Garden, called Free Form III. Interestingly, the sculpture, which is based on the leaves of a tulip, was supposed to have a stem growing up from the space between the two leaves. In fact, there was a stem in his original, smaller version. Somehow, the stem got lost when he created the larger version in marble. He pointed out that there is a space between the two leaves, which is easily seen on the smaller original. The larger version is too big to easily look down and see that there is a space there. 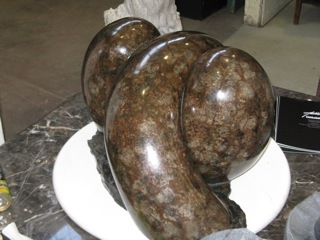 While looking at the original in his studio, I asked him if it was made from granite, and then stared in disbelief when he said that it was painted cast bronze. My immediate reaction was, “How can you paint bronze to look exactly like granite?” Then I realized that I was talking to the supervisor of Paint and Patina from the Atelier. 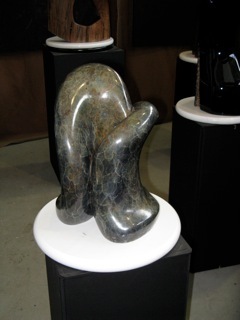 In fact, below is another tabletop model in his studio, one that is also bronze painted to look just like granite. This wraps up the first part of my discoveries and impressions from the Artists in Action event at the Motor Exhibits Building on March 23, 2013. I will continue with my observations in a following blog. Bob Levine is a volunteer docent at Grounds For Sculpture. With a background in computers, he taught college Computer Science in New Jersey for ten years. He then spent the next twenty or so years as a self-employed training consultant, developing and teaching training courses for various companies. Bob lives in Monroe Township, NJ, with his wife Lynn.